Should be a good race tomorrow. Of note...half of the top 10 qualy are Ferrari-powered cars. The slowest two qualifiers today are the Williams w/ the new Merc engine. This tells me that the Ferrari engine is still "on par" with the Merc engine and Merc's aero is giving them the advantage. Seb might be able to do something early in the race being on the faster tires (remember China). We will have the advantage on the straights w/ less drag and higher top speed. Obviously his start will be critical...as will Max's. The team needs to take a long hard look at Kimi and the rest of this season. He has again failed to beat out the Red Bulls, much less the Mercs. At some point the team should realize that we will not win the WCC this year w/ Kimi as a driver and we should let that go, get rid of Kimi, and bring on Leclerc, before the summer break hits, so that he can get familiar w/ the car and maybe challenge Bottas by the latter 3rd of the season when Seb will need the assistance to win the WDC. Totally agree, Kimi is just an anchor right now. No point waiting until 2019 he cannot take points off Lewis, Charles probably would! It wasn't a good result for either of the Ferraris. That said, I believe Vettel will be competing for at least a spot on the podium and possibly a win. The start will be interesting. 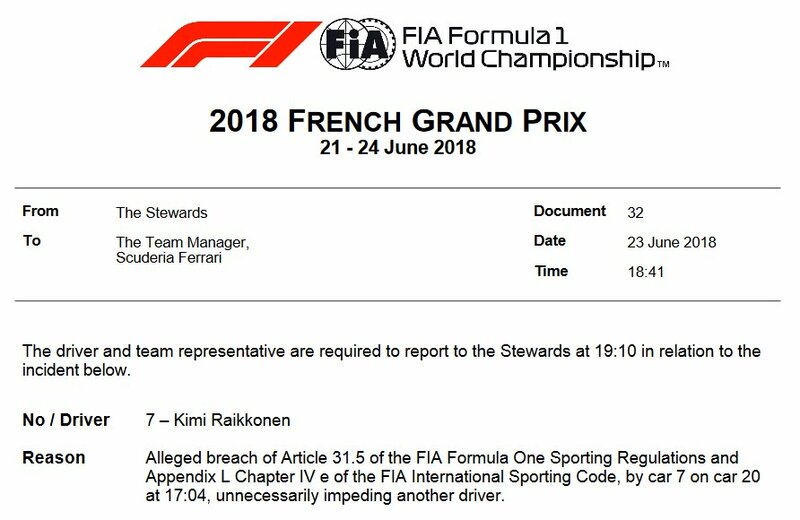 At this point, I would not be opposed to Leclerc replacing Raikkonen for the rest of the season. Leclerc's driving is even more exciting and brilliant that I thought it would be at this point, and that's saying a lot. I really wanted Raikkonen to do well this season and win points, but his performance has really tapered off over the past couple of months. Last edited by Giallo 550; 23rd June 2018 at 16:26. At this point, I would not be opposed to Leclerc replacing Raikkonen for the rest of the season. Leclerc's driving is even more brilliant that I thought it would be at this point, and that's saying a lot. I really wanted Raikkonen to do well this season and win points, but his performance has really tapered off over the past couple of months. Agree most of it... I don't think Lewis for start, but could keep VB behind for sure! Disappointing quali but not surprised, the pressure was on Seb to deliver an unlikely pole and he tried too hard, Kimi again blew it. I'm not making any predictions, but we are on the back foot against the Mercs and Max is beside Seb, so all I hope for is a clean start and hope that the US tyres hold out for long enough to take advantage, otherwise we'll be in trouble from the RBs as well. Charles was exceptional and should replace Kimi at the earliest opportunity. OK with Leclerc in the other Ferrari as long as he is guaranteed equal status and equipment. Like as soon as next race weekend!!! One thing is for sure, vet should have advantage at the start if it’s dry. How he gonna utilize it is gonna be the key. If he jumps bottas at the start n take on Lewis n get the lead then it pays off because on SS & US Ferrari were super strong in race pace. If he stays 2nd n manage the race, even that would be fine. As far as kimi, I don’t know what he’s gonna do. By the way vet on clean & more rubbered-in side of the grid ?? Ferrari need fresh young talent to partner vetal kimis time has come and gone ferrari have kept him one year to long we thank him and his achievents and we retire him just like a good race horse. Do a driver swap now kimi out and the you gun lecrec in. 100% agree with you. He’s the last WDC for us. He should leave on good note. What do you mean by "we"? Le Castellet, June 23 – It was a rain-free qualifying session at the Paul Ricard circuit today, but a day of mixed feelings for Scuderia Ferrari drivers Sebastian Vettel and Kimi Raikkonen. While the former secured third place on tomorrow’s starting grid, the latter could do no better than sixth, due to a few mistakes on his last run. Anyway, the race pace of the SF71H looked encouraging during Friday’s long runs and the race may have some surprises in store for our drivers. Meanwhile, it’s worth noting that five out of six Ferrari Power Units made it to Q3 in today’s qualifying. “During the session”, Seb explained “it was getting better and better and I was more confident. So, I think today we can be happy with the third place. My last run was not spectacular, though, and I don’t think it was good enough to put me n the front row. After my first attempt in Q3, I had thought I could be closer to Mercedes and hoped to improve. But, unfortunately, in my last fast run I pushed a bit too much and made some mistakes here and there. Anyway, the car is good and we proved it. Let’s see what happens tomorrow, as we start with different tyre strategies. I think the car should be strong in the race”. Kimi, on the other hand, was less than happy with his result: “My car was working well today and it was a pretty straightforward qualifying until my last run. I was not able to put a timed lap together in the whole of Q3. The first run was pretty decent, but then I went a bit sideways in turn 11, and lost time. After that I was not able to improve my lap time. For tomorrow we chose the strategy that we think is the best for us, but we have to wait and see. In other races we have seen people starting with different tires and it did not change things from night to day. For sure tomorrow will be a challenging day”. Should Vettel be behind himself later in the race he could get tow and DRS from himself which would be rather spectacular IMHO. By we i meant ferrari this will happen i have family in italy and the word is kimi has been already been tapped on the shoulder and can leave tomorrow if he chooses to or ferrari will pay out his contract .For vetal to win the wdc he must have a solid rear gunner lewis has this seb can only do it on his own which is tough how can you play the role of an effective number 2 when you are always slow the majority of the time in race mode this is the issue ferrari can not have a cruzy number 2 no matter how many fans he has results win championships not nice drivers. I had no idea you were in position to speak for Ferrari. Live and learn, I guess. Starting grid tomorrow. Seb next to Max, and if it's wet....should make for an interesting race tomorrow. Turn 1 is going to be a nail biter. Does it mean after the race ??? Really?? who was avaliable when Ferrari re-signed Kimi?